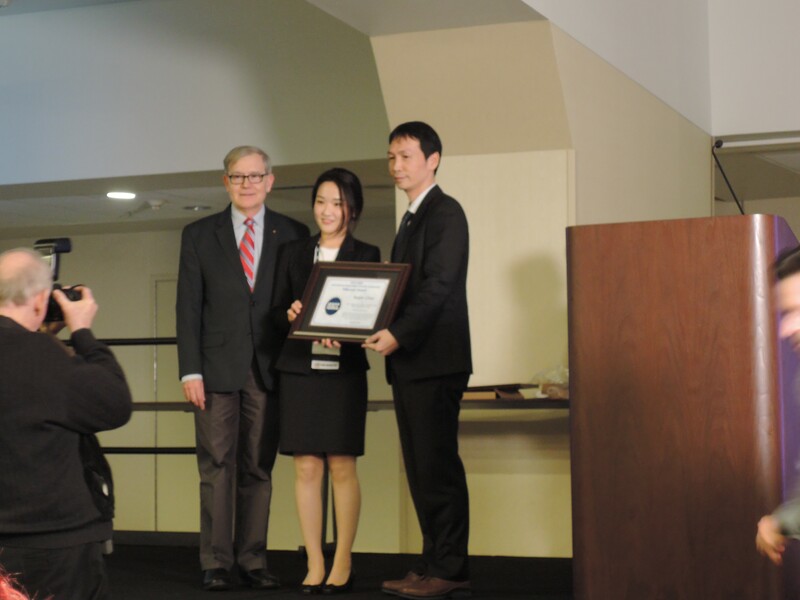 UNIST ECE, Seojin Choi (center), supervised by Prof. Jaehyouk Choi (right) has been selected as the IEEE ISSCC 2016 “Silkroad Award” winner. From left are Seyeon Yoo, Seojin Choi, and Prof. Jaehyouk Choi. A UNIST graduate student, Seojin Choi (School of Electrical & Computer Engineering) has been recently recognized at the 2016 IEEE International Solid-State Circuit Conference (ISSCC 2016), the single most prestigious conference in the field of semiconductor circuit designs. 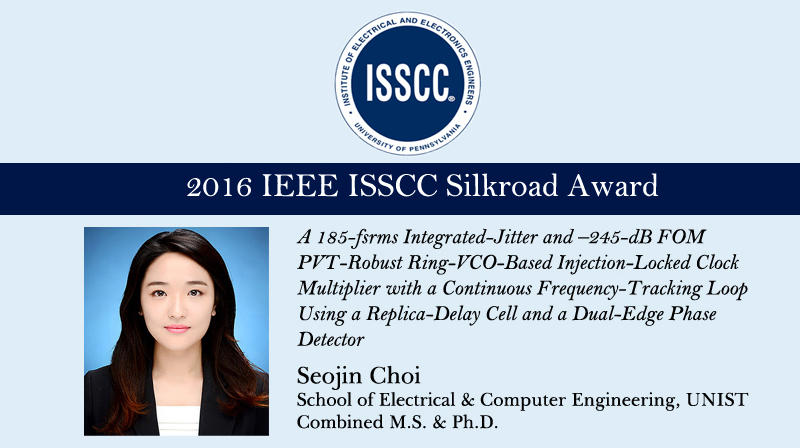 In recognition of her excellent work in the field of Electrical & Computer Engineering, Ms. Choi was selectced as the “Silkroad Award” winner for the 2016 IEEE ISSCC in February in San Francisco, California, USA. Under supervision of Prof. Jaehyouk Choi (School of Electrical & Computer Engineering), Ms. Choi and her colleague Seyeon Yoo (Combined M.S./Ph.D. student of Electrical & Computer Engineering) have proposed a novel clock-generating circuit for digital or wired-line applications, such as CPUs, Smartphone AP, or high-speed Ethernets. It dramatically improves noise performance and robustness, and shows outstanding performances compared to state-of-the-art conventional architectures. Every year, ISSCC brings together an incredible range of talented engineers in a single venue. Annually, the conference, which is also known as “the Olympic in the field of semiconductor circuit designs” is attended by over 3000 semiconductor circuit designers from global industries and universities.